Raisin The Dead by Karoline Barrett 2nd In Series Out April 19th. 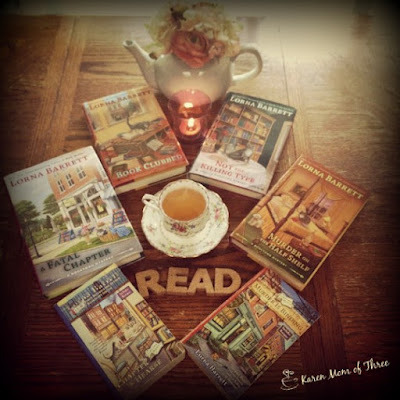 I was selected to read an advanced reading copy of Raisin the Dead by Karoline Barrett and though I did not read the previous book in this series I have to tell you I was very pleasantly surprised. I worried that because I had not read the previous one I might not understand or be able to get into this one but I was very pleased to be wrong. By the second chapter I was up to speed and it really did not matter. 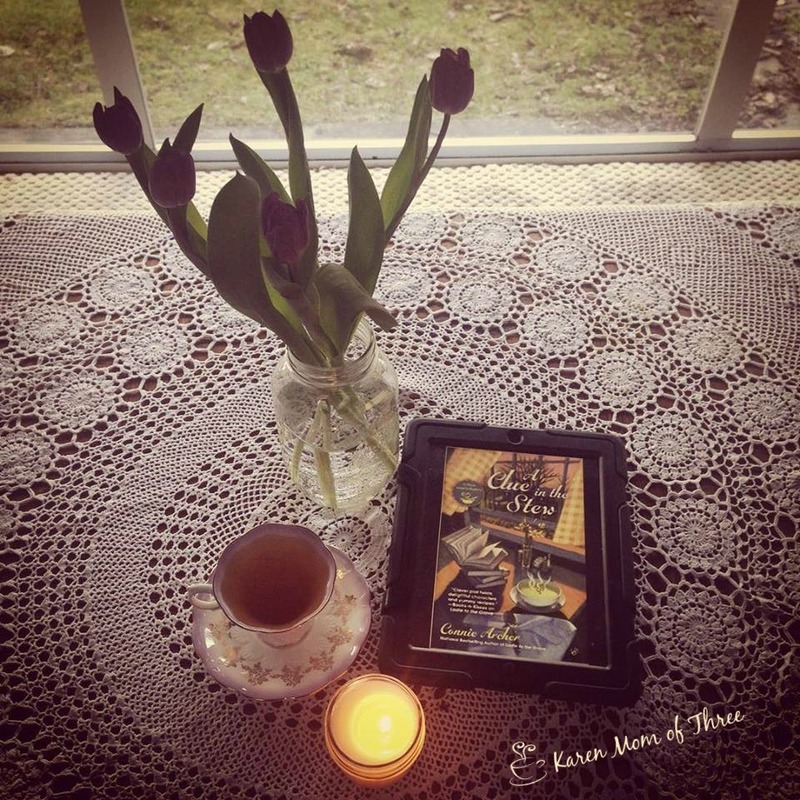 The characters are fun, the romantic story line was better then I expected and the twists and turns and a very interesting mystery coupled with over the top characters, great friendships and a community of women who support each others crazy antics was waiting for me the the chapters that followed. While the rest of Destiny is focused on the arrival of an upper crust perfume mogul, Molly is more concerned about what’s on the front page of the newspaper: her mother. Library director Anne Tyler was photographed at the most romantic restaurant in town having a cozy dinner with library advisory board member Philip Baldelli. But there’s more for Molly to worry about after Philip is found dead a few days later. When Detective Sean Corsino zeroes in on Anne as a person of interest in the case, it turns down the heat on his budding romance with Molly. But after Whilhe’s injured during the course of his investigation, Molly and Olivia must step in to sift through the clues and clear Anne’s name. Bun For Your Life by clicking here. I enjoyed this story, I find I am already wondering about book three! A New Hawaiian Series From Kathi Daley. Mahalo Kathi, I Needed A Series Like This! Trading snow boots for flip flops, in Kathi Daley's new Sand and Sea Hawaiian Mystery series Book One Murder at Dolphin Bay was just what I needed Monday night. As my Spring Break drew to a close, I was in the need of a tropical escape. 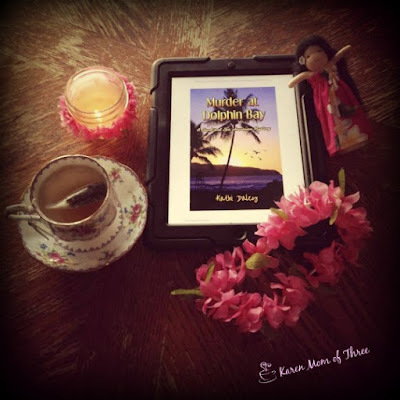 I was lucky enough to find myself in Hawaii in 2013 so it was even easier to picture myself in Hawaii while I read. 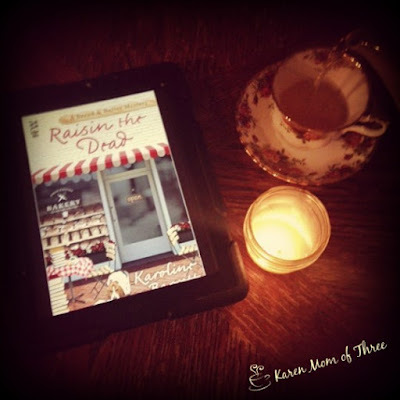 Kathi's new series is one I know I am going to look forward to! She knows how to put the right combination of characters in just the right setting and have you hooked from chapter 1. Kailani Pope wants nothing more than to be a proud member of the Honolulu Police Department. Both her father and grandfather were cops, her five brothers are cops, and the only thing she has ever wanted from the time she can remember wanting anything, was to be a cop. She has passed all the requirements to be selected for the police academy but somehow her number never seems to come up. While she is waiting for her name to work its way to the top of the list she works as a lifeguard for the Dolphin Bay Resort. When a guest of the resort is found murdered, Kailani decides that if she can solve the murder before her brother who has been assigned to the case by HPD, then the department will have no choice but to take her application seriously and move her to the top of the list. Like all of the books I have read by Kathi Daley, I could not put the ipad down. 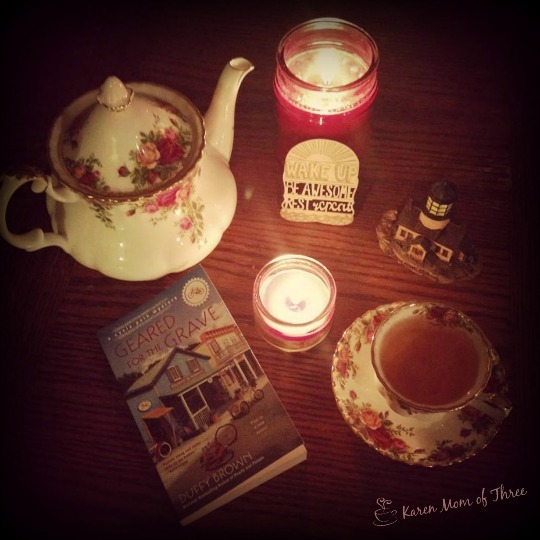 Finding myself happily lost in the setting, caught up in the mystery and story and smiling from ear to ear at the end. 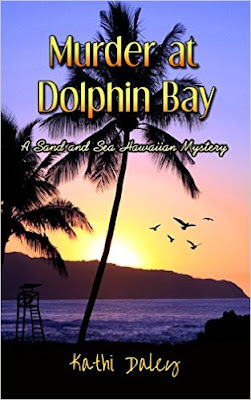 To order your own copy of Kathi's Murder at Dolphin Bay please click here. Today I am thrilled to share my review of Cookie Classics Made Easy a new book by Brandi Scalise which is out May 3rd. 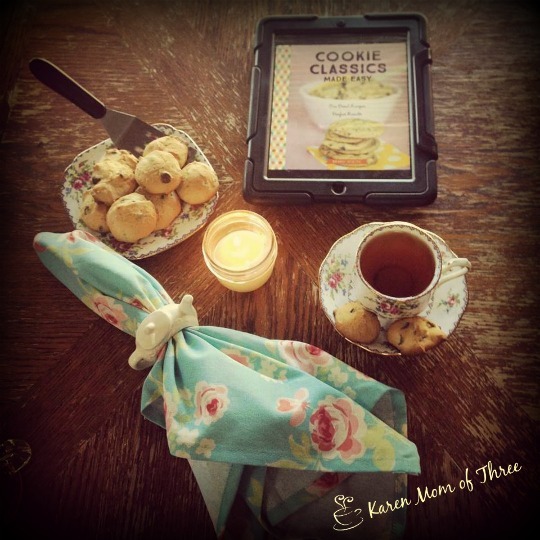 I was very excited to be selected to review this 40 cookie recipe cook book and yesterday I made the Chewy Chocolate Chip Cookie Recipe from the book. My kids were thrilled and I was too! The dedication and the intro to this book quickly endeared the author to my own heart. 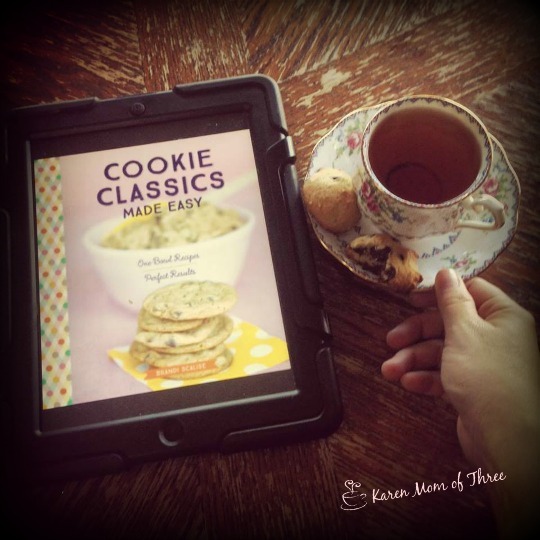 Cookie Classics Made Easy is a wonderful book for anyone who loves cookies, is learning to bake or is an experienced baker! I really like that each recipe is easy to follow and has easy to find indigence. There are classic cookies like the ones I made and there are some wonderful taste combinations I had never dreamed of, Key Lime, Pumpkin Spice, Cinnamon Morning and how about Vanilla Walnut and Pear! 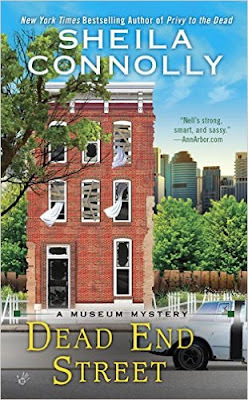 As a cozy mystery lover who lives on the West Coast of Canada, I love reading cozy mystery books that take place in small towns on the East Coast of North America, so when I was scrolling through my PDF Copy of this book I have to say cookie recipes with the name like "Winter in the Berkshires", as well as "Nantucket" peaked my interest. As a tea lover I can not wait to try "Nina's Cup of Tea"
Knowing how much I love to bake cookies, one year for Christmas my sister Bre-Anne got me one of my most favorite gifts ever! She bought me a bag of each type of Chocolate Chips that Hersey's Made. I still to this day think this was the best gift idea! I think if you have an up coming wedding shower, birthday party or even someone moving out, or on to college this book would be a great gift along with an assortment of chocolate chips, a big bowl, a cookie sheet and a spatula. I believe I will be buying an actual copy of this book and for my Christmas Cookie Exchange next year using at least one of these recipes! 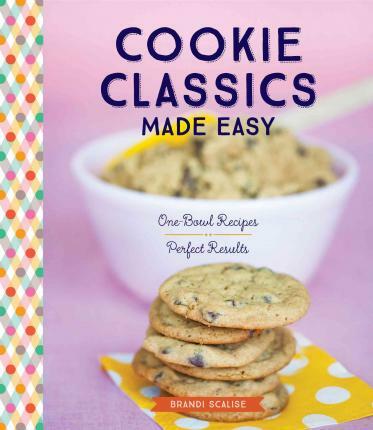 To order you own copy of Cookie Classic's Made Easy (with Free shipping from The Book Depository, like I am going to) Please click here. 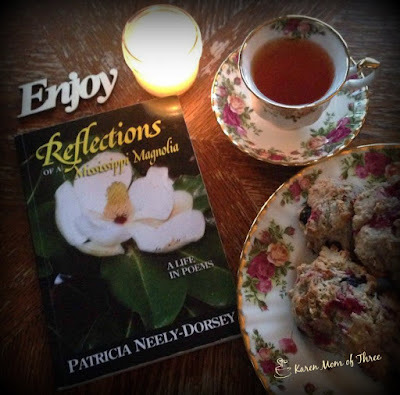 Thank you for joining me today for a cup of tea and a cookbook review, I look forward to sharing more with you again tomorrow. PS. 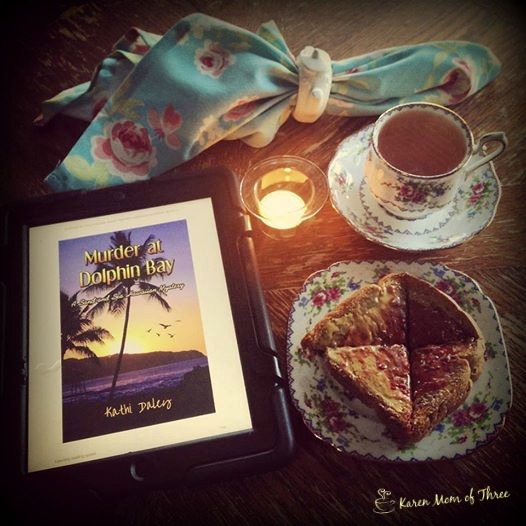 I am looking forward to sharing my review of Kathi Daley's New book Murder at Dolphin Bay with you soon! 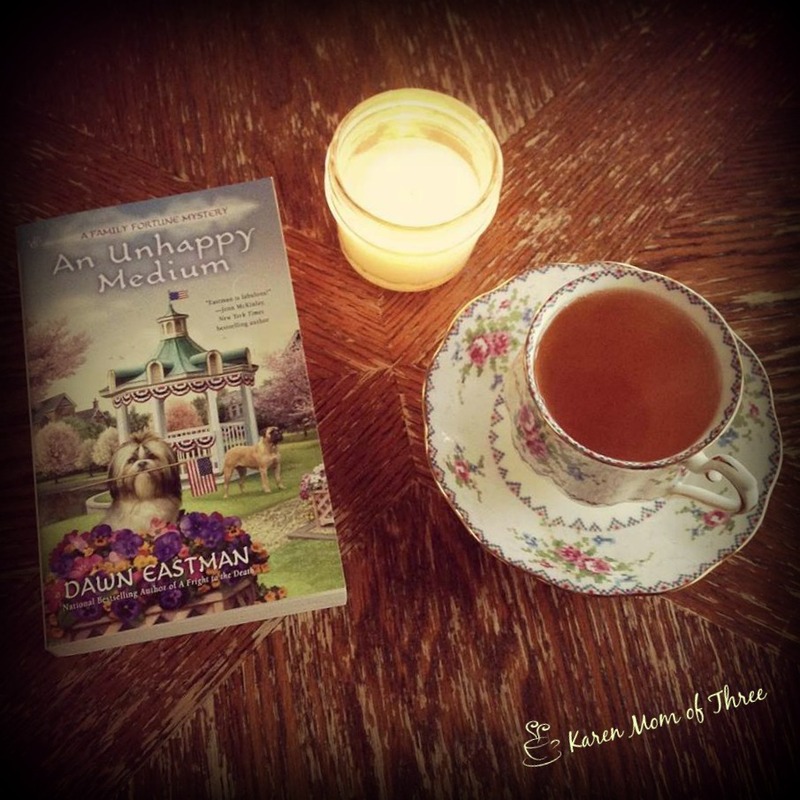 Dawn Eastman's An Unhappy Medium Makes For An Exceptionally Happy Read! 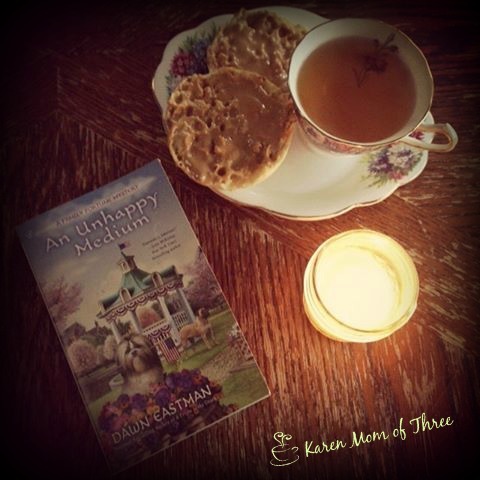 I do not know what it is about the way Dawn Eastman writes but it sure does make one feel at home. 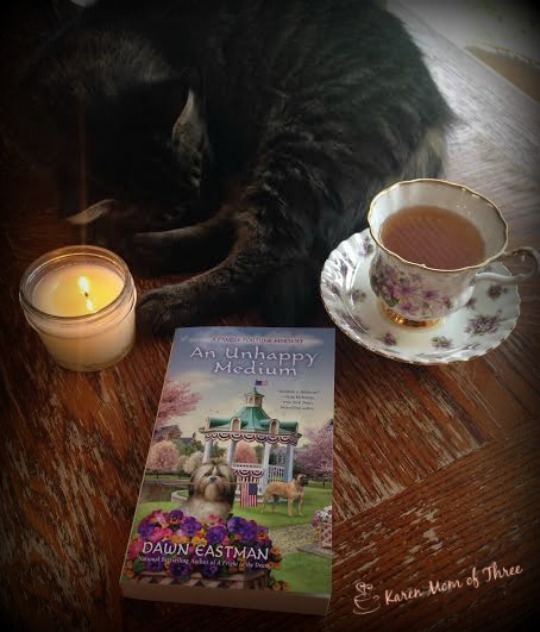 Book four in the A Family Fortune Mystery Series Titled An Unhappy Medium is out April 5th and is is this cozy mystery lovers favorite type of cozy. A touch of paranormal, a large dose of dysfunctional family, great relationships and even a Zombie Charity Fun Run. One of the things I like about An Unhappy Medium is that you learn more about Crystal Haven and the towns history. This story will take you along for the run, with main character Clyde's, her eccentric Aunt and eclectic family this mystery is exciting and it is endearing. This is only one of the the reasons I pre order each book in this series and why I think you should order this series and add it to your favorites list! Psychic Clyde Fortune and her zany family are back in the fourth in the national bestselling series from the author of "A Fright to the Death." "Former cop and novice psychic Clyde Fortune finds herself in a race for justice when a Zombie Fun Run turns deadly..." "" All of Crystal Haven, Michigan, is psyching up to participate in a Zombie Fun Run organized by Clyde s nephew Seth, but Clyde is fretful about the undead festivities. 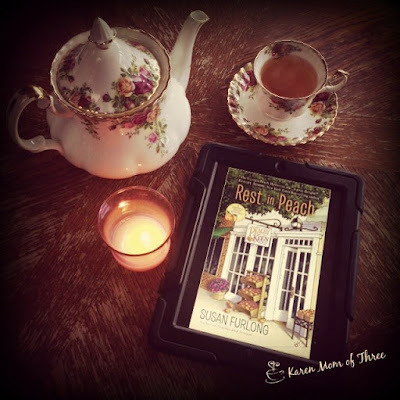 For one thing, her sister, Grace, has unexpectedly returned to town after fifteen years. For another, Clyde has the nagging feeling that something is about to go wrong... When one of the zombie runners is found murdered and then Grace disappears, Clyde realizes her grim premonition is dead-on. Now, she and her police detective boyfriend Mac must find a ghoulish murderer before someone points the finger at Grace. And when a tangled web of family secrets and old grudges combines with a mysterious case of stolen diamonds, even someone as quick-witted as Clyde might not be able to outrun a killer..."
To order An Unhappy Medium from The Book Depository please click here. To learn more about this series and Dawn Eastman please click here. Wow! What A Ride! 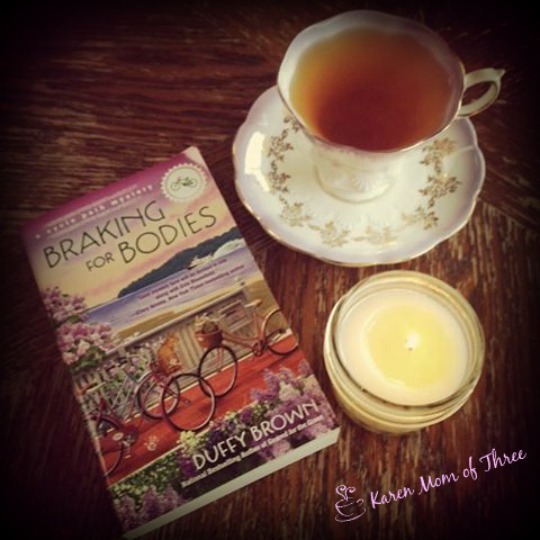 Duffy Brown's Braking For Bodies Took My Breath Away Literally! For the second time this year, I finished a book out of breath and heart racing. Is it a coincidence the last book that did that to me was the first book in Duffy Brown's Cycle Path Mystery Series? Both books Geared for the Grave and now April 5th's release of Braking for Bodies have left me with my heart a racing. By chapter 15 I actually had to get up and find my inhaler. I am pretty sure I stopped breathing while I read, really who needs to go to the gym? Duffy Brown's series is set in a truly picturesque cozy town, an Island no less, of Mackinac Island. I had never heard of this place before I read these books but I tell you by chapter 2, I was ready to pack up everything I own and open a tea shop there. 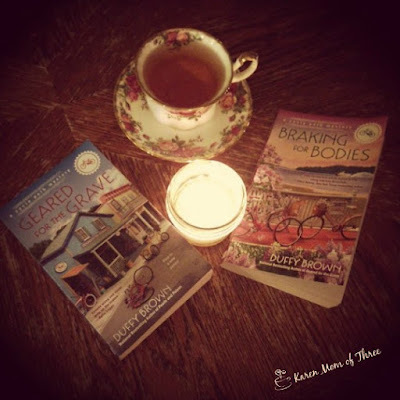 This series has some of the best one liners and in Braking Bodies, I was laughing out loud, holding my breath ( a little too much) and turning the pages so fast! There are "ooh's", there are "ah's" there are "Oh my God's" and there are "Wow's in this book that will make your head spin! Smart one liners and characters to make your heart smile. The first book was exhilarating, as I said in my review of Geared for the Grave, I have never wanted to high five a character more. 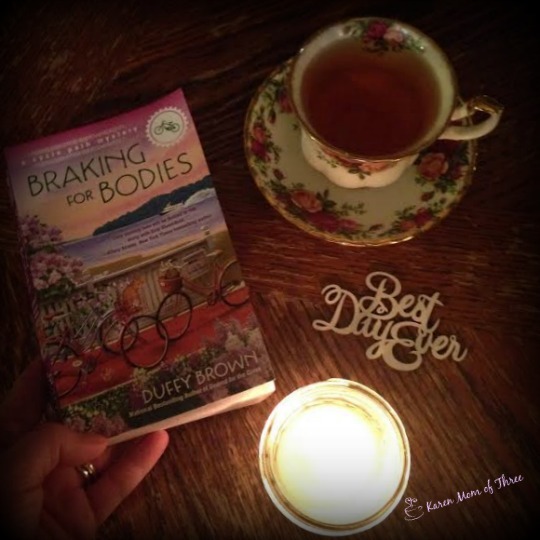 In Breaking for Bodies, I could not even catch my breath. When I turned the last page I was in awe and I was anxious! I am hoping that there will be a third book in this series out soon! My blood pressure is still high as I write this review, I only hope that I will dream about this series and story tonight so that I do not have to end my time on Mackinac Island or my time with Evie, Fiona, Molly, Irish Donna. I love a series with so many strong and vivacious female characters, don't you? I am very excited to for all of you to read and fall in love with this story and series. I also can not wait to hear what you all think. Now when I tell people I am dreaming of the Island, you will know it is this Island and not some tropical paradise, who needs paradise when you have friends, a cool bike shop and an island full of fudge!
" Moving from Los Angeles to small, picturesque Mackinac Island to work in a bike shop might seem crazy, but Evie knows it s the best decision she s ever made. That s not to say she s gotten rid of all her stress; after all, the upcoming Lilac Festival has everyone in town riding in circles. But things really go downhill when a ferry full of tourists including Evie s friend Fiona s former boss, the editor of a sleazy rag in LA arrives on the island. 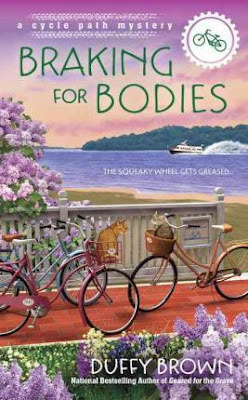 No one knows why Peephole Perry came all the way to Mackinac, but things aren t looking good for Fiona when Peep is found dead. Now Evie has to gear up and get a grip on the truth if she wants to clear her friend s name..."
To order your own copy of Breaking For Bodies from The Book Depository please click here. To order book one Geared for the Grave please click here. 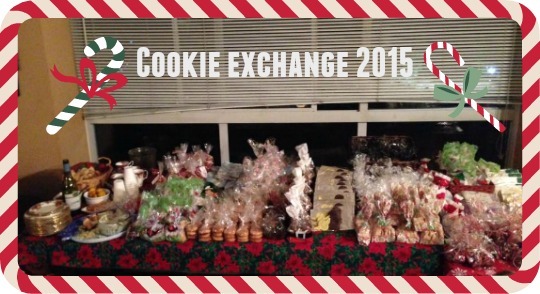 Visit Duffy on line by clicking here. Boy oh boy where has the month gone? What a wild week this has been. Sadly Spring Break for us is ending Tuesday and I shall miss the reprieve. I am counting the days until summer break for sure. I think I am the most excited person when school is done for the year. This week had it's ups and it's downs. 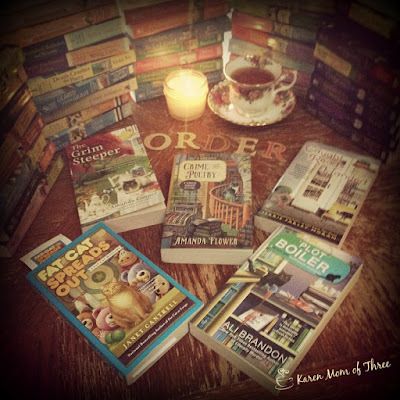 While I have been trying to promote the cozy community in whole and recommending that each person who reads also reviews I thought it might be fun to take a photo with a few of my favorite books piled on my table. My photos had the effect I was looking for and made me so happy. 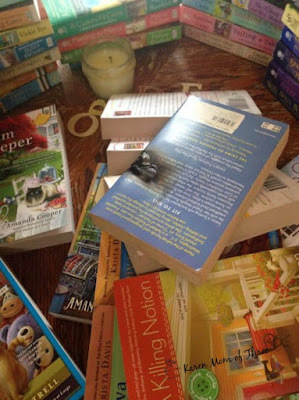 As I was editing the photos for my blog my curious kitten Mia manged to some how knock over a pile on to my candle which I did not sadly notice in time. Heart broken but thrilled that I was only 2 feet away, there was one casualty that I am truly heart sick about and it seems to be out of print. 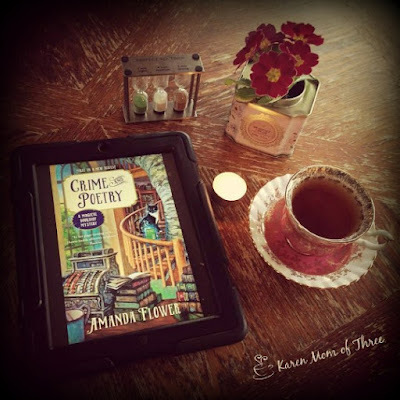 It was one of my first cozy mysteries I ever read, I am now looking to replace it. If you have not read Ellen Byerrum's Crime of Fashion Mysteries they were one of my first series and one of my favorites. This was my favorite of the entire series as I said before so I am a tad sad. New on my table this week some of April's most amazing series. 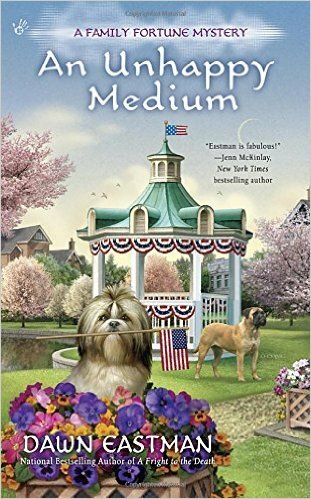 Duffy Brown's Braking For Bodies (which the review will be up Sunday) was such a wild ride, Ellery Adams Breach of Crust, Connie Archer's A Clue in the Sew, Susan Furlong's Rest In Peach, Amanda Flower's Crime and Poetry and I am currently reading Dawn Eastman's An Unhappy Medium. These books are out April 5th. 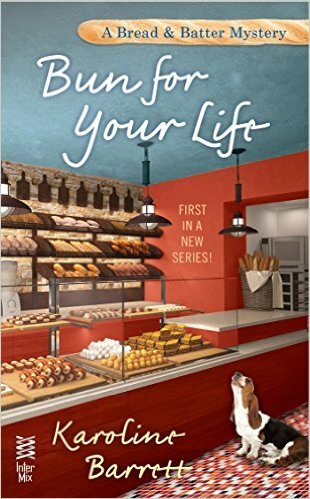 Out in June, I finished Sheila Connolly's book as well this week and I think you will enjoy book 7 in this series. I shall leave you here and thank you for joining me for a week in review, It is a good thing our kitten culprit is cute! 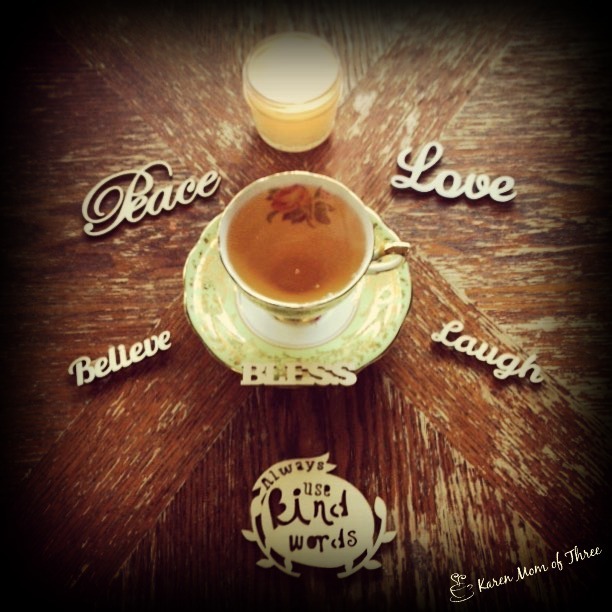 Lifting my Caramel Black Tea cups and toasting you all. 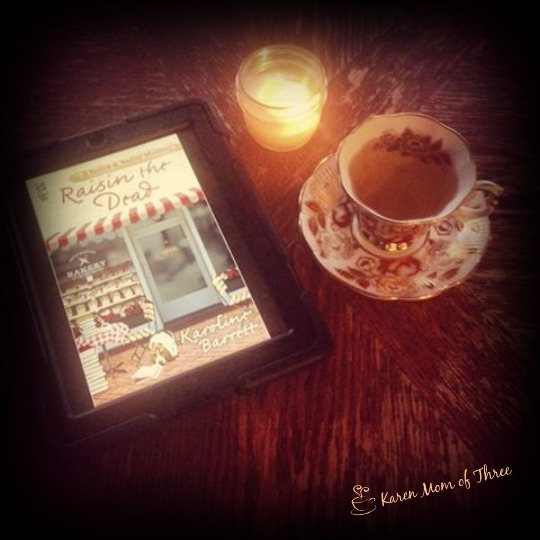 Thank you for joining me for a cup of tea and a cozy mystery week in review. 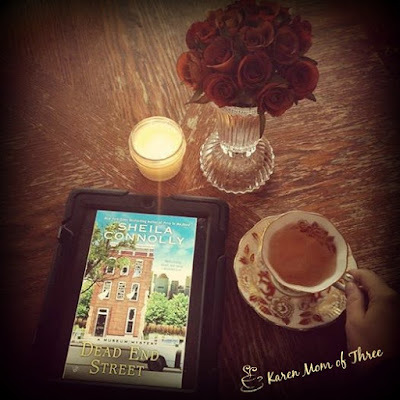 Dead End Street A June Release You Will Want To Pre Order! 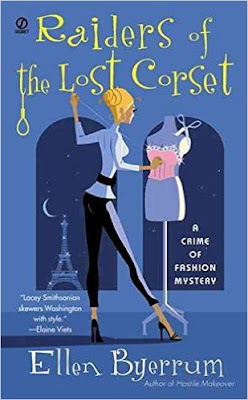 Sheila Connolly has a edgy and relevant cozy mystery coming out this June. Dead End Street out June 7th was a very good read. Book 7 in the Museum Mystery Series could easily have been turned into a one hour tv show series. It had everything you would want in a great mystery and was so well written that it would be easy to see it adapted for the screen. When the Pennsylvania Antiquarian Society discovers it owns some unique real estate, a deadly plot unfolds . . . Society president Nell Pratt believes life is finally going her way. Everything s running smoothly at work, and her love life is thriving. Then some unexpected news rocks her foundation. Two members of a local neighborhood rescue program, Tyrone Blakeney and Cherisse Chapman, inform Nell that her society owns an abandoned row house in a rundown area of Philadelphia and they insist on taking her to see the property before its date with the wrecking ball. But soon after they arrive at the house, Cherisse is fatally shot and Tyrone is badly injured. The police believe it s just random violence in a bad neighborhood, but Nell thinks there s more to it and is determined to find answers before someone else becomes history . 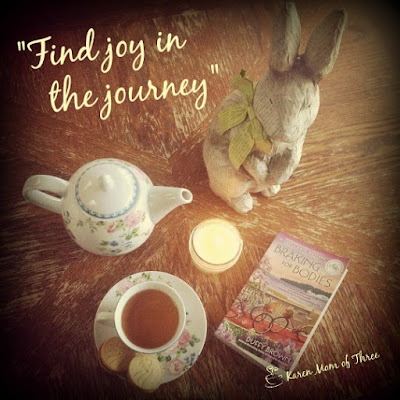 . ."
As I said this as not your everyday run of the mill cozy, and while I was on edge most of the time I was reading the story it did leave me with that warm and fuzzy feeling that a good cozy does. To order your own copy of Dead End Street please click here. I read this on Facebook recently and it spoke to me. Most people have no idea what it is like to be an author and or how much they make. I was curious myself. 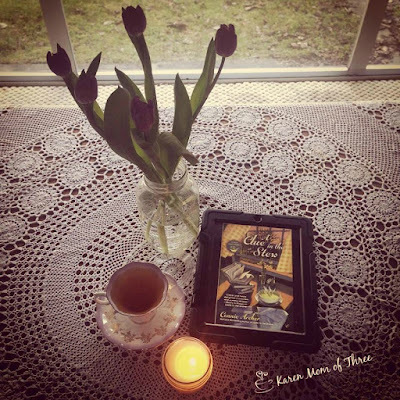 After a few years of reading, reviewing and connecting with many authors, I always wondered why they all seemed to have day jobs, burned the midnight oil on Facebook and still managed to turn out their stories and series. I know that so many of these authors give their hearts and souls to their writing and when you look at this meme you realize just how little of the "pie" authors really get. How can you help an author? 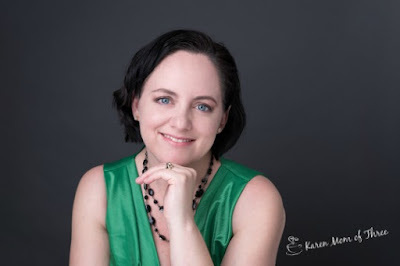 Ordering or requesting a book for borrowing from your library is great but if you really want to help an author I can not stress enough about how important it is to review each book. 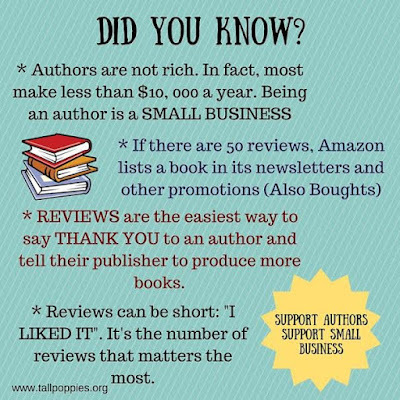 Your review can be a few short words, such as "loved it" or "can't wait to read the next one" or even longer and more thoughtfully written. Each review counts and really does help make a series succeed. Do you pay for your own books? I have been getting this question a lot lately so I want to clear things up. I buy almost all of my books. Except for 5 books on this table and 6 others not shown I have bought every one of these books. I have been writing and reviewing books for a while now because I love it. I do not expect anything for free. Recently I have been very lucky to have been selected to read advanced reading copies of books, all of which I have pre ordered. That means yes for some of these I will have duplicate books, which I will donate to my local library or save for my own Tiny Library when it is finally built and installed. My wonderful uncle has said he is making me one but he lives 3,000 miles away and we see each other if I am lucky once a year. I still am hopeful my own library will come to fruition and I will stack it with these books. I don't cancel the pre ordered books even if something has been sent to me to review. Why don't you do give away's of your extra copies of your books? Honestly the cost of mailing one paper back book from Canada even with in Canada is $9.99 currently. This is the main reason I use the Book Depository, shipping is free. It costs more then the cover price of the book to mail a book with in Canada at the moment. 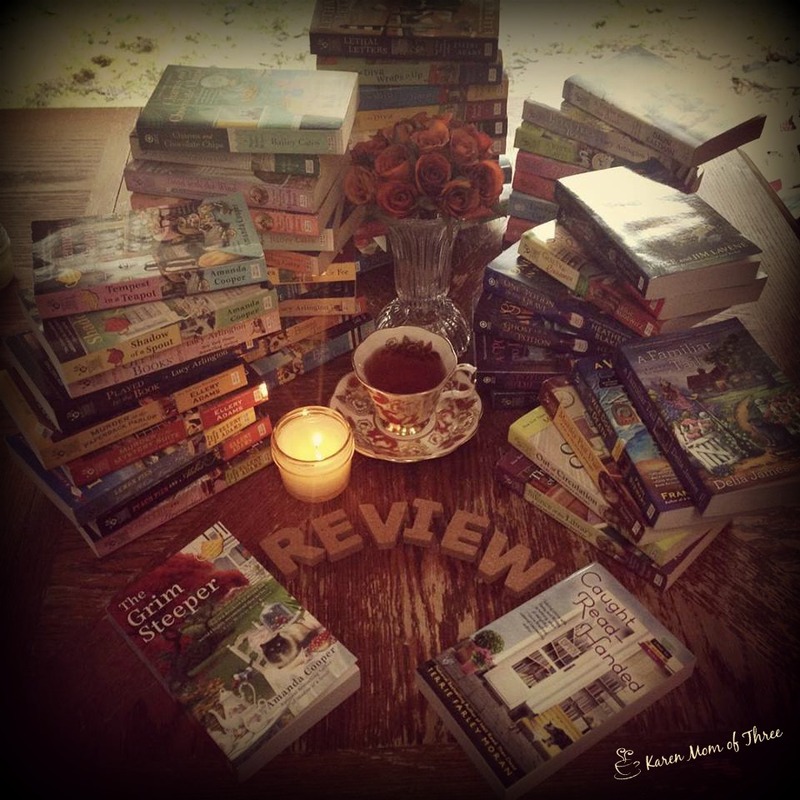 Other questions I often get asked are Do you get paid to review books? The answer is no, I don't. Did you get paid to write for Kathi Daley, Amanda Cooper or Terrie Farley Moran's books? I have recently had some success having things I have written published in a few series. No I did not get paid for my contribution. Yes I ordered my own copies of the books that have items I wrote published in them. I feel it is an honor to have been included. I am touched by the friendships I have made through my work with cozy authors street teams, Facebook groups and my own reviews and photos. I welcome all your questions even this one I get more often then you would think. If you don't get paid for it, why do you do it? The answer is because I enjoy it, the reading, the connecting and the joy of doing it makes me want to continue. 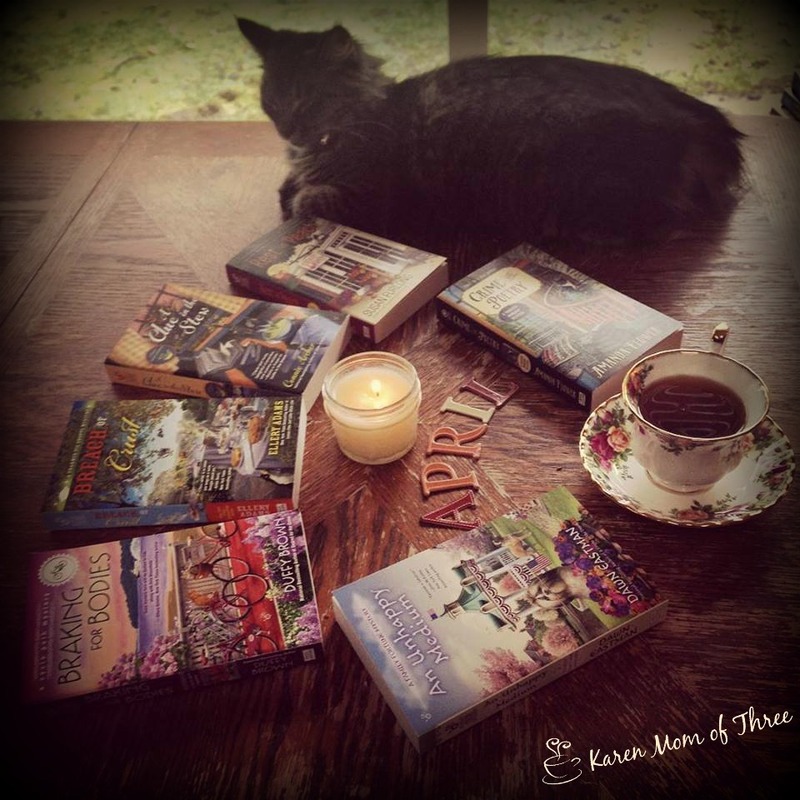 Today I wanted to let you know about a Movement in the Cozy Community to try to help save several of our favorite cozy series and their authors from being cut from the publishing house Every single Berkley and NAL author is in jeopardy,of having their series canceled or cut short. PRH (penguinrandomhouse.com) is the publishers of so many of our favorite series. I understand that they feel they will sell more copies of fewer books by culling their authors and series. There are ways you can help if you feel so moved. You could write to them and express how much these series and authors mean to you. It is my hope that your emails help revive PRH's interest in keeping more cozies. You could also speak with your local libraries about ordering more cozy mysteries for your own community. Pre-ordering books also makes a huge difference. Connecting with your favorite authors through social media and their own websites will help you to know if they have books that are coming out. I am hoping that squeezing an extra cozy or two into your monthly budget helps us all not to loose the wonderful work of so many authors. 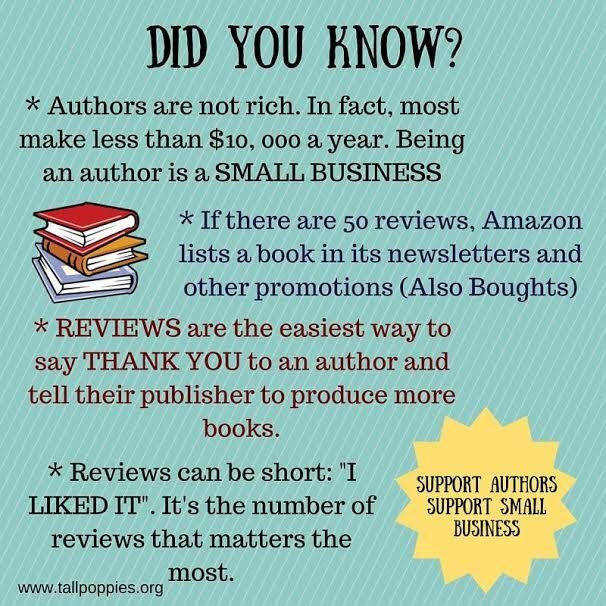 Review and share your reviews of the books you have read, Amazon, Good Reads, The Book Depository trust me it makes a difference! There are groups you can join to discuss cozies and one near to my heart is called Save Our Cozies click here to learn more about this group. Waking up to the words there has been another terrorist attack...as I did this morning makes me so very upset. I am tired of this, as I think we all are. I do not have the answers for world peace, I am not a politician nor do I want to be at this point in my life but I do believe in being a beacon for peace in a world that seems to be stuck in the fog. We need lighthouses. Lighthouses of every shape, size and color lighting the way and guiding the way for peace, understanding and love. I think we have many people like this, like me in the world, but I think we have a distribution problem for that message for kindness, peace, friendship and love. Get to know your neighbors, their neighbors and families then make them your friends. Make friends of all faiths, backgrounds and social economical backgrounds. Learn from them, from their history from their struggles from their journeys. 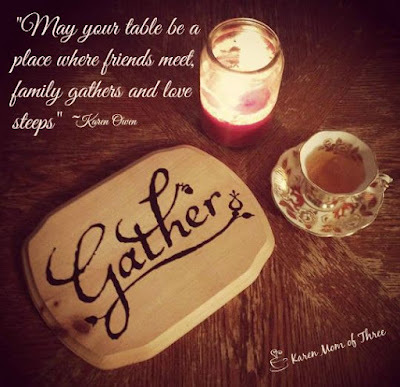 I have friends of all different faiths, I treasure those friendships, those connections and I feel very blessed to have each of them in my life. We are more together then we are apart. Shine your lights, shine them bright and put the kettle on, it is going to be a long night. In a large bowl place your flour, quick oats, sugars and baking powder. Add the butter and use a pastry blender to cut the butter into your mix. Add apple sauce, milk and egg. Mix until just combined. add your frozen fruit,fold in and then spoon on to a parchment lined baking sheet. I made 12 coffee shop sized scones but you can make them smaller and get 24. Bake until edges and tops are golden brown serve with a pat of butter or with Devonshire cream. 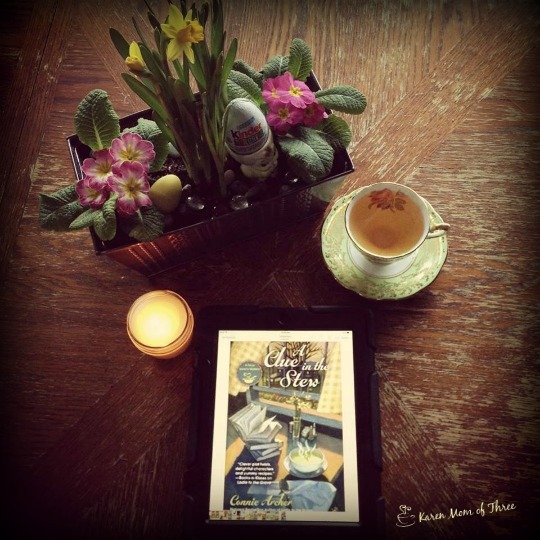 Serve with a healthy dose of cozy mystery or your favorite poetry and a great cup of strong Irish Breakfast tea. 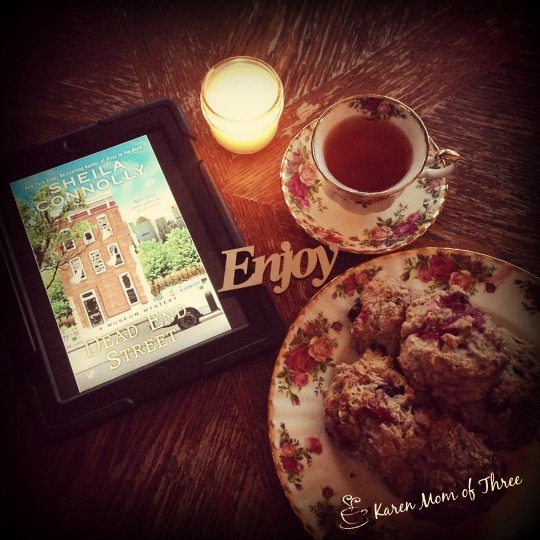 Thank you for joining me for a cup of tea a cozy mystery and a scone recipe. Friday night I finished A Clue in The Stew by Connie Archer, out April 5th. 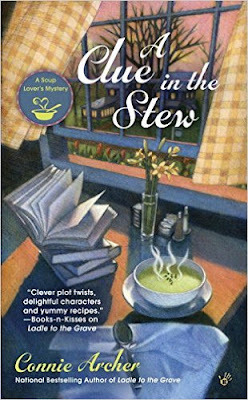 I enjoyed reading A Clue in the Stew, the series is a good one and I love the recipes for soup in the back of each book. My friend Lisa of Lisa K's books turned me on to this series and I am forever grateful. "Soup shop owner Lucky Jamieson stirs up more trouble in the latest mystery from the national bestselling author of "Ladle to the Grave.".. When Lucky Jamieson opens up By the Spoonful to host an event with a famous author, she s not expecting a bunch of nuts to descend on her small-town soup shop. But the author s exasperating entourage from a prickly publicist to a snippy son and his tipsy wife give fresh meaning to the phrase, too many cooks spoil the broth. The evening is more than spoiled, however, when it ends with a homicide. When the manner of the murder as well as another recent unsolved crime echoes the author s fiction, Police Chief Nate Edgerton realizes he has a copycat killer on his hands. And Lucky hopes that one of her regular customers who has mysteriously gone missing isn t involved. 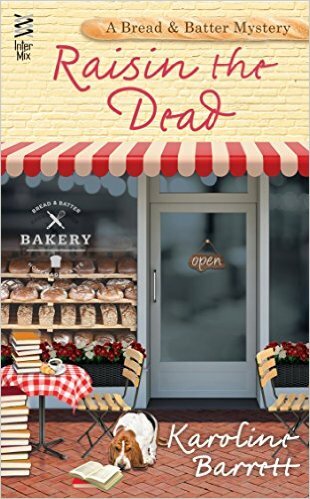 Once again, the soup shop owner will need to stir up some clues to find her friend and catch a cunning killer before things really take a tureen for the worse..."
There were several reasons I enjoyed this book, one I felt that I could easily identify with Lucky, the main character. The main mystery plot and the sub plot had me guessing until the end but I was truly touched with the way that Connie Archer wrote about the relationships of the characters. I felt that (with out giving anything away) the story was written from a very thoughtful and very positive place. I felt that Connie Archer choose to take a very emotionally charged situation and character's life story and choose the high road for that character, without diminishing the truly remarkable survival story and resiliency of her characters. I was not expecting to feel the way I did towards the end of the story, I felt that I had been personally invested in Lucky's investigation and felt such relief with the outcome. I have a lot of respect for Connie Archer and how she choose to tell the story of A Clue in the Stew. What a week. I am so thankful to be on Spring Break even though we have been doing mostly doctor appointments it has been nice to just not rush. I was proudly wearing my green this week as this is my first true St. Patrick's day knowing my Irish heritage. 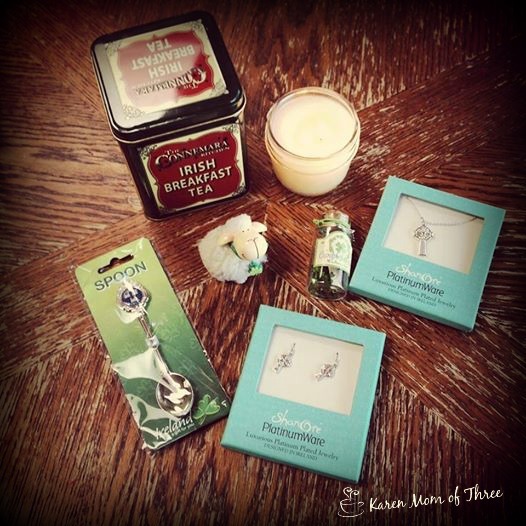 I was so touched when a friend who lives in Ireland send me a care package shown below and it arrived on St. Patrick's day. I am so unbelievably lucky with the friends I have made online over the years . They are some of the most giving and kind people that I honored to call friends. Thank you Tracey! I am so very touched! I wore my new earrings and my necklace with pride and love everything you sent me, especially the little sheep! This week I read and reviewed three books. 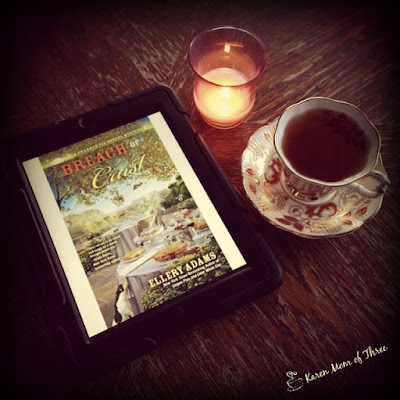 It was such a delight to have Ellery Adams Breach of Crust on my table this week along with Susan Furlongs. Rest in Peach was a wonderful story and a great second in series. All three of the books I read this week are out on April 5th. 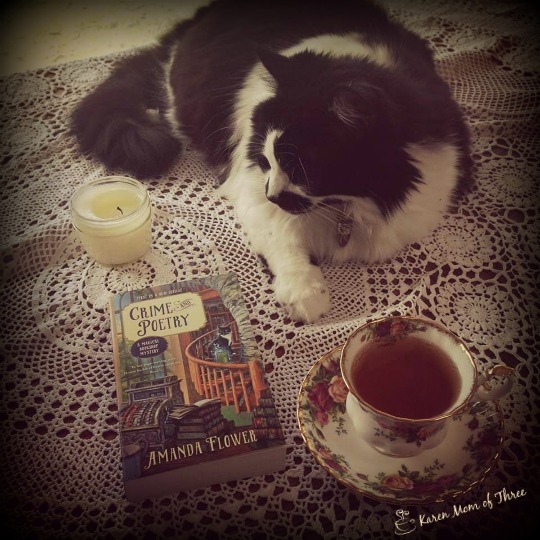 Crime and Poetry is a first in series from Amanda Flower and was so much better then I could have imagined. I am looking forward to another book in this series and I hope we won't have to wait to long. I was treated to a paper back copy of Crime and Poetry in the mail box on Friday and I was tickled when Squirrel sat down to join me for tea. 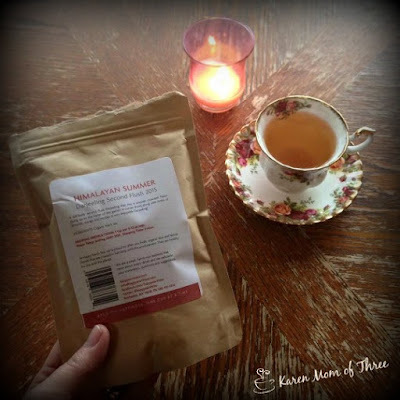 This week I was rather adventurous on the loose leaf tea front and I had three new teas I tried, while I only got the first one up for review I promise to share more on my tea finds in the next few weeks. This lovely Darjeeling, from Happy Earth Tea was a tasty treat! Another lovely friend brought over a planter she made for me, It was such a wonderful surprise and all the daffodils have now opened, it is quite a nice arrangement. 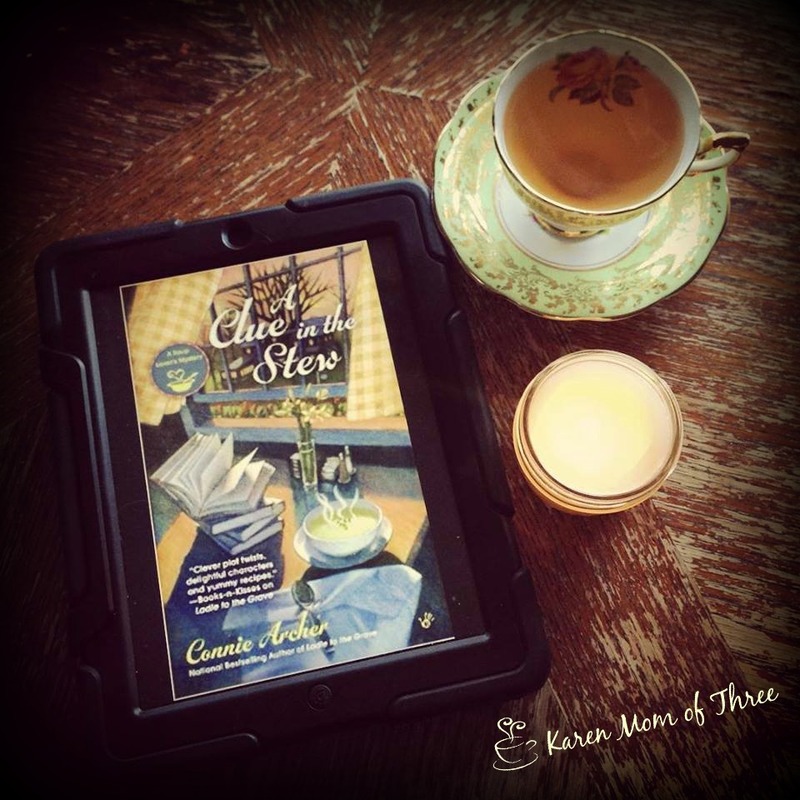 I am also working my way through the April release of Connie Archers book A Clue In The Stew. My Kitchen Witch Tea Pot Find!